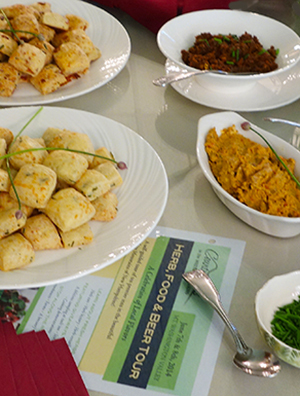 A savory addition to our guests’ breakfast bread baskets, these biscuits were featured for the 2014 Herb Tour. They can be made bite-sized as well and filled with a savory filling for serving with cocktails or at afternoon receptions. Cut butter into small dice and chill in freezer for 10-15minutes until very firm. Preheat oven to 425 degrees F. Place flour, baking powder, and salt in the bowl of an electric mixer fitted with the paddle. Mix briefly on low speed, then add the slightly frozen butter and continue to mix until the mixture resembles small peas.Whisk together the eggs and buttermilk, then add to the flour mixture and mix only until just moistened. In a small bowl, mix the Italian cheeses, Parmesan cheese, chives (and bacon if desired) with 1/4 cup flour, then add the cheese mixture to the dough and mix until barely combined. Do not overmix. Bring one half the dough together by kneading gently on a floured board. With a rolling pin, roll the dough into a rectangle. Using a sharp, floured knife, cut the dough into squares and place on a baking sheet lined with parchment paper. Repeat with the remaining dough. Brush the tops of the biscuits with the egg wash, and bake for 20 to 25 minutes, until the tops are golden brown. For cocktail biscuits, omit the bacon and cut into bite size squares. When cooled slightly, split, and fill with sliced ham, turkey, etc. Replace top halves and serve warm.